Brand activation agency Traffik has created a series of multi-sensory experiences in the newly-refurbished Darling Park precinct, giving visitors the unique opportunity to enjoy iconic Australian natural wonders they may never get the chance to visit in real life. 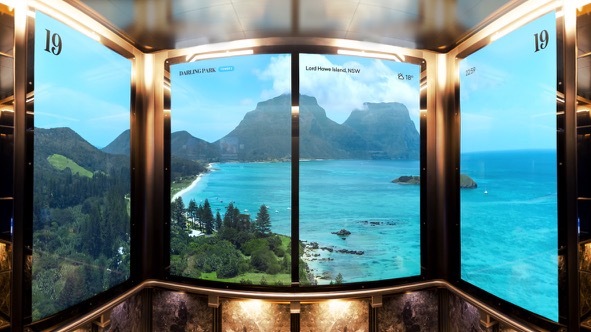 Users travelling up the elevators can look out to stunning views of scenic locations including islands, rainforests, deserts, beaches, mountains and sea cliffs. Teaming up with architects Davenport Campbell & Partners and Schindler Lifts Australia, the never seen before seen immersive experience has been implemented across six elevators, supporting a strategic play to put Darling Park on the map and make it ‘Sydney’s most vibrant commercial district’. Elevator journeys include the vast depths of Kings Canyon in the Northern Territory, remote Lord Howe Island 800 kms off the east coast, the breathtaking Ebor Waterfalls in Dorrigo NSW, the rugged sea cliffs around Cape Pillar in Tasmania and the peaks of the iconic Blue Mountains – with each experience accompanied by a rich soundscape. Traffik captured 6k drone footage spanning 100 vertical metres in each location then mapped the footage to the rise and fall of the elevators using a combination of lift-controller data and accelerometers on the top of each lift car. 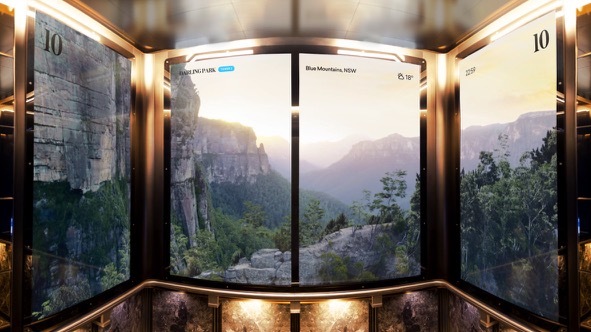 Elevator cars are lined with 90 inch high-definition portrait screens and the experience is driven by a high-end PC secured to the roof of the elevator car running a custom Unity software application networked back to the motor rooms at the top of the building. 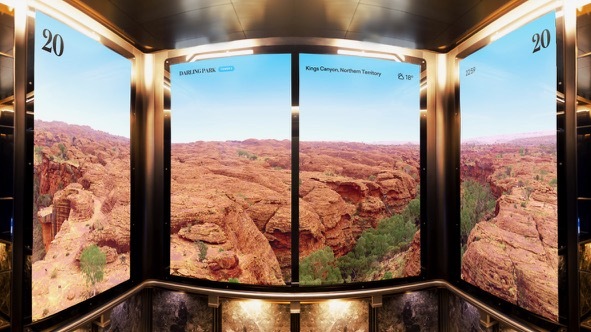 The elevators, media walls and wayfinding platform have been delivered under one centralised CMS, allowing Darling Park building management to remotely schedule any piece of content, advert or elevator experience via the web. 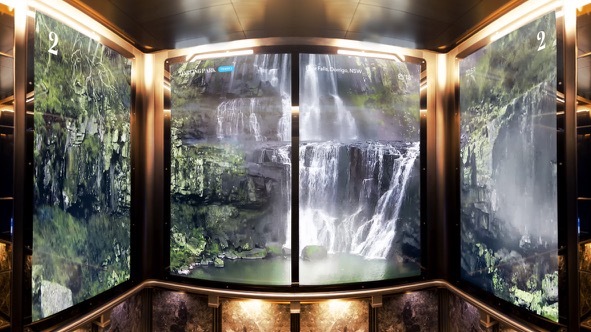 The immersive elevators form part of a broader digital evolution of the Darling Park precinct including three new media walls and a custom digital wayfinding platform to help tenants and visitors navigate the three-tower precinct and surrounding tourist attractions. Users can send individual route-maps to their mobile phone to complete their wayfinding journey. To bolster retail engagement the platform also allows retailers to advertise to visitors and building owners to deploy building related messaging. This will probably cop the classic toxic comments from old school ad peeps whining that there’s no insight or idea but I think we need to accept that in 2019, quite often tech IS the idea. Definitely evokes an emotion. I dig. Wow. Almost as wrongtown as The Battered Wife fish n chip shop that just closed down. Ok. I like it. I like it because it’s using an office lift. It’s providing an escape. Perfect place to put your destination ad and the perfect audience. Normally a critic. But i don’t mind this. Won’t win many awards, but it does its job. You dolt. Schindler is a common German name and the company pre-dates not only Stephen Spielberg but also the Nazis. Ha! What buffoon didn’t know about Schindler’s Lifts.